brining in a food truck would be lethal; when i do it in my kitchen it smells like death for three days. Don't you HATE when that happens while brining your food truck? THE WORST. my food truck is a raw food truck, obviously. with a bit of freegan candy thrown in to keep things scary. That's the answer to everything on the commercial Internet. But is it absolutely true? I don't understand. I mean, obviously, but still. What does the author of this missive gain by connecting you with the owner of a Mediterranean eatery? @Hillary It's PR, lady. 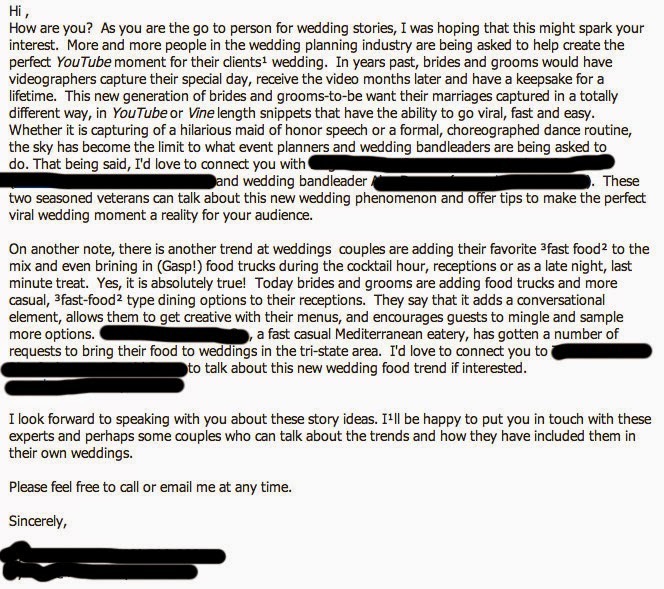 He's hired by the wedplanner + bandleader + Mediterranean eatery to send out these stellar emails. Also, as a publicist, I feel the need to say that this is perhaps the worst pitch email I've ever read. *Viral wedding*? What about bacterial weddings? Like with probiotics? Like with a kimchi food truck? That you could brine in? I'm just impressed that you actually read any of these. I'm so twitchy with the spam button that if I can't see my name in the first sentence it's gone before I even open it. Someone should rock this as a wedding dress.